application form in College website and attach the with all copies of Educational certificates and recent PassPort size photograph to the college Address given below. 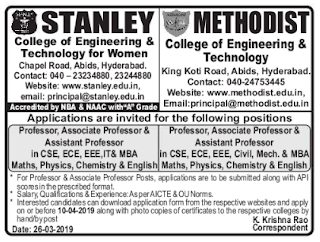 Refer the Official website http://www.stanley.edu.in/ for more details of Stanley College of Engineering and Technology for Women Professor/Associate Professor/Assistant Professor Posts. Available vacancy, Salary, Important dates, Selection Process, Application Procedure, Qualification are maintained below. 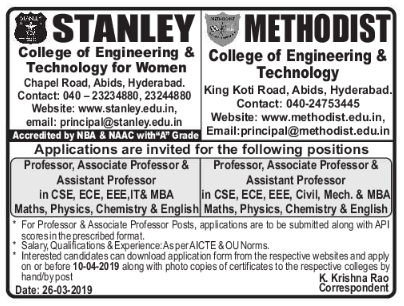 Ending Date to apply: 10-04-2019. Eligible candidates can download the application form in College website and attach the with all copies of Educational certificates and recent PassPort size photograph to the college Address given below.